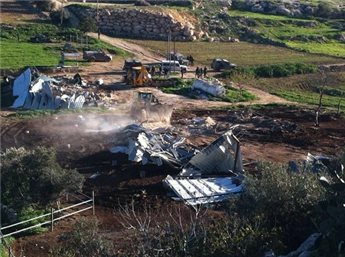 HEBRON (Ma’an) — Israeli forces on Thursday destroyed a dairy factory in the Hebron village of al-Burj, the owner told Ma’an. Yasser Muhammad Salim Masharqa said that Israeli forces and civil administration officers escorted two bulldozers to the village and demolised the steel structure, which measures 2000 square meters. Cements rooms measuring 400 square meters were also destroyed. The factory is located near the separation wall in the southwest of the Hebron district. The owner was not allowed to remove machinery from the factory before the demolition. Israel has demolished at least 359 Palestinian structures in the West Bank so far in 2014, according to the Israeli Committee Against House Demolitions.